Organic compounds are compounds that usually come from organisms. They always have carbon but may contain other elements like hydrogen, oxygen, and nitrogen. Examples: Alcohol, Sugar, Fat, Protein. At one time it was thought that the makeup of living things was totally different than that of non-living things. A clue for this difference was how they responded to heat. For example, think of cooking an egg. 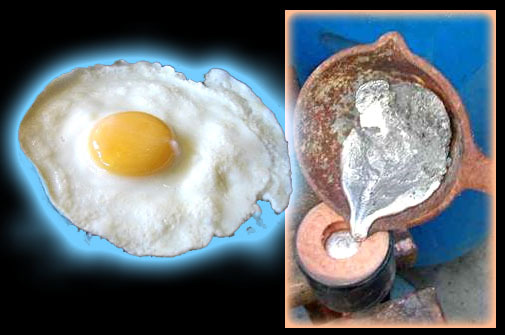 The egg white starts off clear and liquid but heating it makes it white and solid. When cooled, it doesn't return to its original conditon. However, heat up lead, for example, and it will melt, but upon cooling it returns to its original condition. So there seemed to be a difference. It was also believed that living things had a "life force" in them, which again made the chemicals in living things unique. There was a belief that the chemicals in living organisms (organic compounds) could not be synthesized by man using non-living chemicals (inorganic compounds). 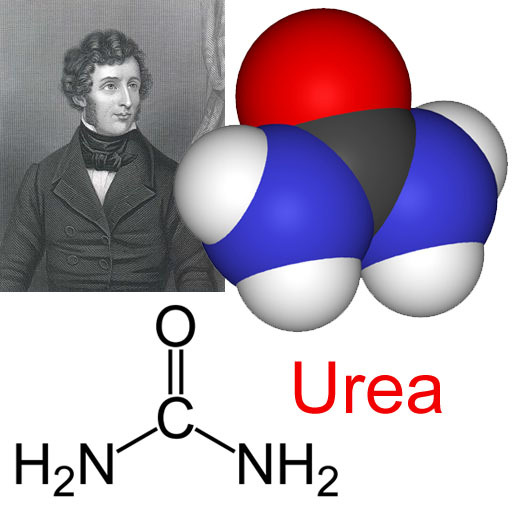 However, in 1828, a chemist named Friedrich Wöhler accidently created urea. Urea was a compound that mammals produced to get rid of excess nitrogen. Urea is secreted in their urine. Friedrich created it using inorganic (non-living) salts. Everyone was surprised, but chemists then knew that it was possible to create chemicals found in the body using chemicals from the ground or air (non-living sources). So now organic compounds were not defined as only those compounds from organisms, but compounds based on carbon. Hydrocarbons are the simplest of the organic compounds. 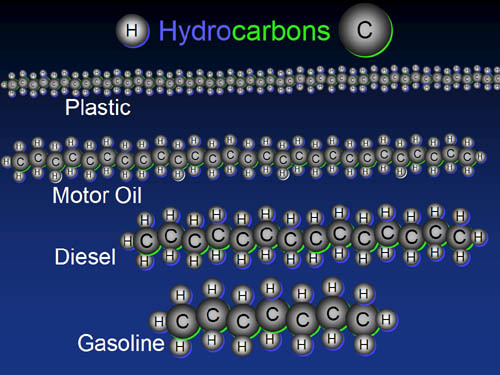 As the name suggests, hydrocarbons are made from hydrogen and carbon. The basic building block is one carbon with two hydrogens attached, except at the ends where three hydrogens are attached to the carbon. Remember carbon has vacancies for four electrons in its outer shell. So it wants to bond to four atoms. 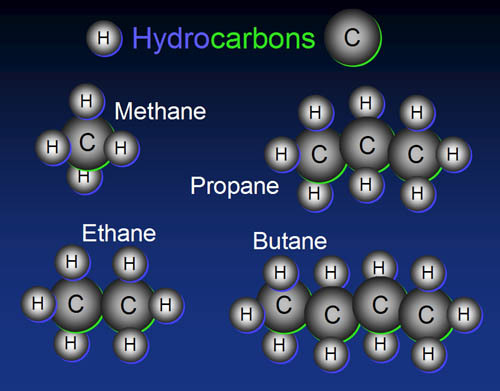 Here we see hydrocarbons with one to four carbons: methane (natural gas), ethane, propane, and butane(lighter fluid). When the chain is between 5 and 9 carbons, the hydrocarbon is gasoline. At about a dozen carbons,it is diesel. Around 20 carbons is motor oil. A chain of hundreds to thousands of carbon and hydrogens make plastic. This particular plastic is polyethylene. Before we go to the next building block, let's look at the simplest hydrocarbon, methane, in three different representations. The upper right shows elements as spheres with their chemical symbol. The left one shows carbon's 4 electrons being shared with 4 hydrogens. This is the shaped of the electron clouds. The bottom right one helps us see carbon's four outer electrons and the four vacancies that four hydrogen atoms could fill. Instead of four hydrogens, what if we slipped in an oxygen? 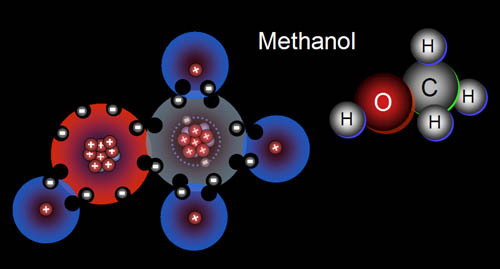 Methane becomes methanol. 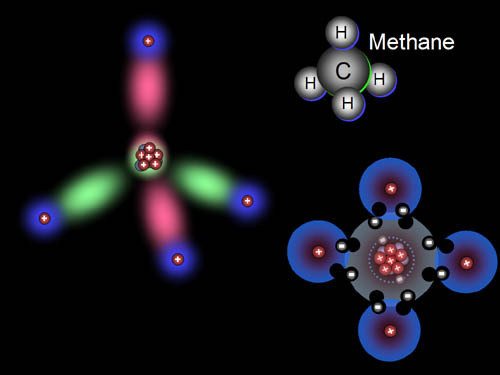 Here are two representations of methanol. Oxygen is a more versatile building block than hydrogen. Hydrogen can only connect to one other atom because it only has one electron and one vacancy to offer. Oxygen, however has six outer electrons, meaning it can reach its full eight electrons by sharing one electron and one vacancy with two different atoms. 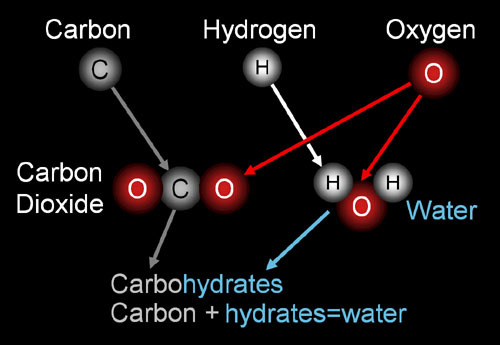 Here we see oxygen connected to both the carbon and to a hydrogen. By combining oxygen with carbon and hydrogen, we can make any kind of alcohol. Here are the simplest. Methanol is also called wood alcohol. Ethanol is drinking alcohol (also called grain alcohol). Three carbon alcohol is called propanol. 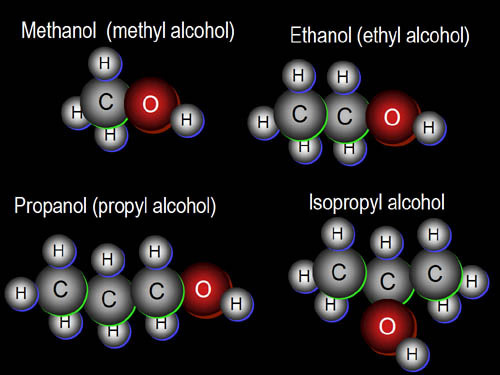 If the alcohol group (OH) is on the middle carbon, it's called isopropyl alcohol (rubbing alcohol). Alcohols are not the only compounds that use the three elements of oxygen, hydrogen, and carbon. Organic acids is another class of organic compounds that uses these three elements. Let's start with a few common small organic acids. You should notice that an extra oxygen replaces two hydrogens. Remember, an oxygen has two vacancies and two electrons to share. Formic acid is the smallest organic acid. Acetic acid is very common. Butyric acid is produced when butter goes rancid. These are all acids because the hydrogen bonded to the oxygen can come off easily. More exactly, just the nucleus (1 proton) of the hydrogen comes off. Hydrogen's electron stays behind. Organic acids combined with alcohols are building blocks for all kinds of flavorings and fragrances. In this example, propanol is boiled with acetic acid. 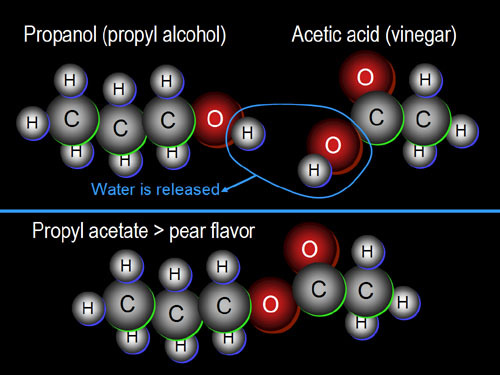 As the bump into each other, the OH from the acetic acid combines with the hydrogen from the alcohol to make water, H20. 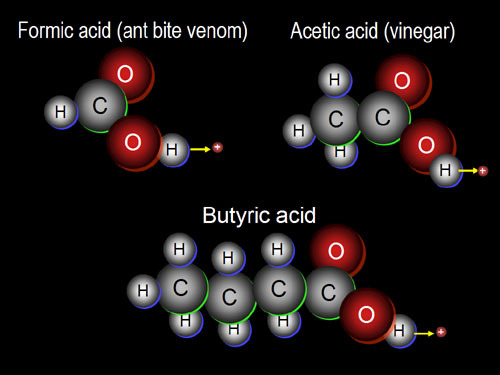 One more example is ethanol mixed with butyric acid. Upon boiling, they combine by releasing a water molecule. 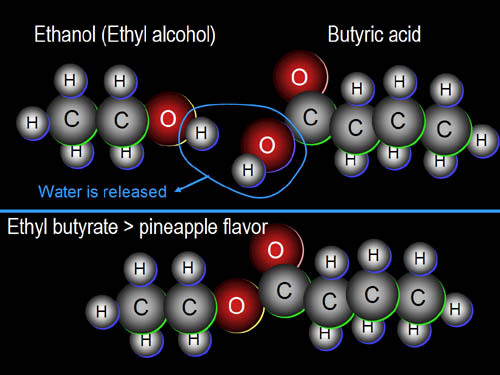 The result is ethyl butyrate, which has a pineapple flavor. It's interesting how flavors can come from molecules that have no similarity with the final flavor. Stay tuned for a link that will have many more examples. 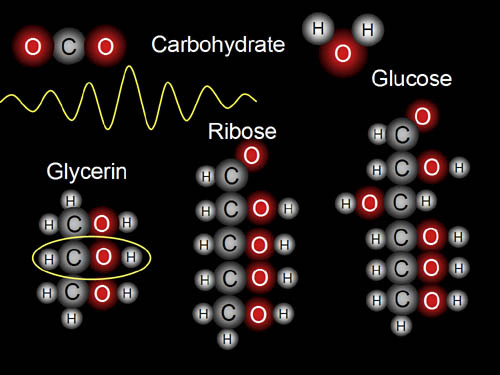 Another class of compounds that use carbon, oxygen, and hydrogen is called carbohydrates, or the slang word, "carbs." 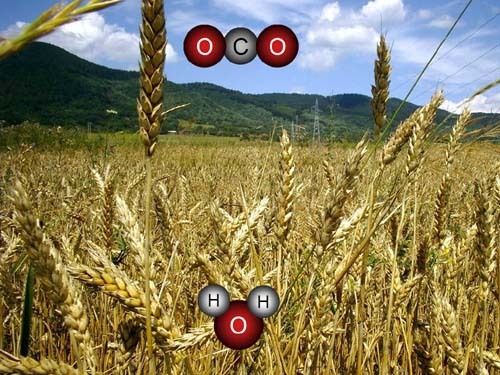 The name, carbohydrates, is a good one because it indicates carbon and water. Remember, dehydrated means loss of water, and to be hydrated means to add water. Below are some examples of carbohydrates. 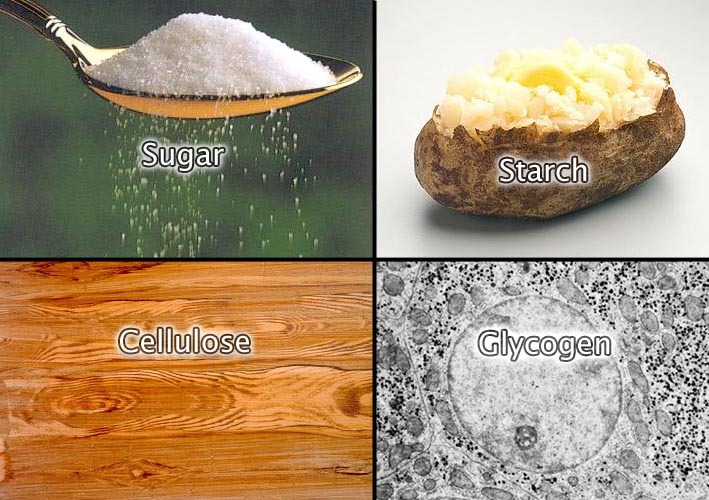 Sugar, starch, cellulose (wood fiber), and glycogen. Glycogen is like starch but is created in animals for the purpose of storing chemical energy. The small black granules (dots) are glycogen. 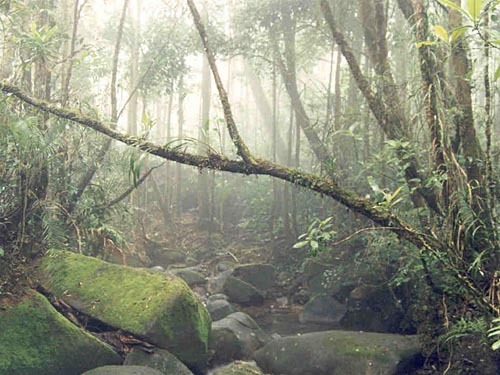 With energy from light, plants can build sugars from carbon dioxide and water. Glycerin (also called glycerol) is not a sugar but is basically one half of a glucose sugar. The repeating building block seen in sugars is a carbon attached to one hydrogen and one oxygen that is also attached to a hydrogen (OH). Below we see the sugar glucose in different forms. 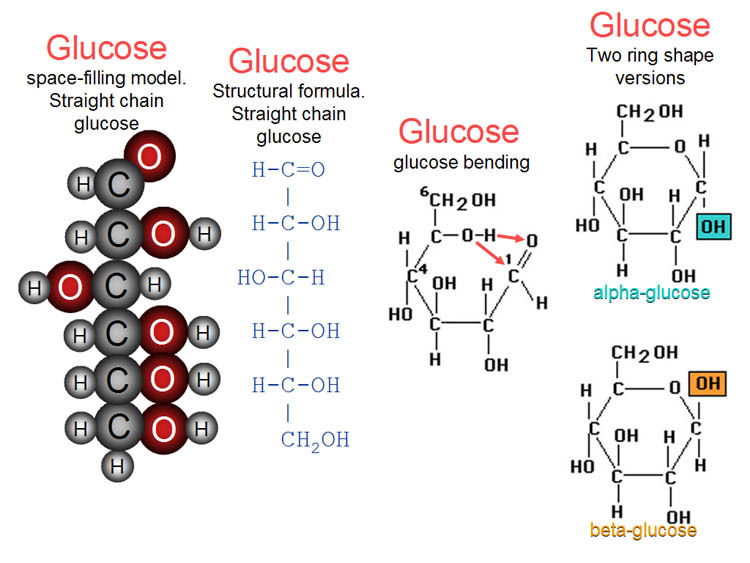 The left one shows glucose as a straight chain and with elements shown as spheres (space modeling). The next one is the same except drawn with element symbols and lines representing bonds. In water glucose is constantly bending and forming itself into two different ring configurations millions of times a second. In both cases the oxygen at the end of the straight chain attaches itself to the carbon on opposite end. The hydrogen jumps off the oxygen and turns the double-bond oxygen (=O into OH [hydroxide]). Sometimes this OH will end up oriented downward (alpha-glucose), and other times the OH will be oriented upward (beta-glucose). 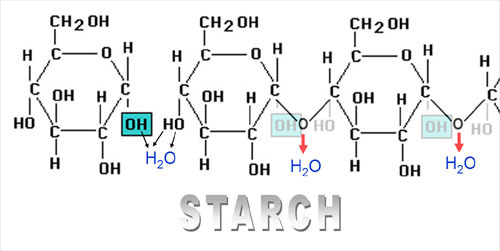 The alpha version of the ring shaped glucose is used as building blocks to make starch. 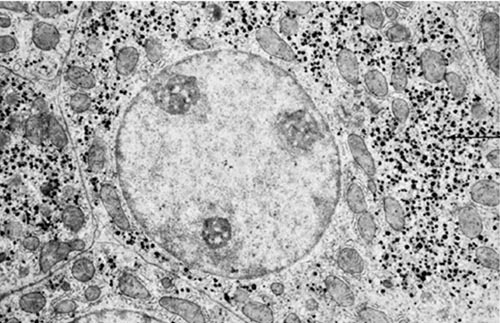 The alpha glucoses are arranged side by side. The hydroxides (OH) from both sides donate a hydrogen. One of the hydroxides (OH) donate a oxygen. Water is formed and released. The left over oxygen forms a bridge to connect the two glucose molecules. 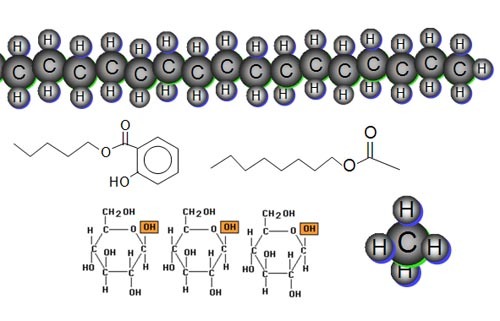 This picture shows the chains of alpha-glucose in a simplified form, but you can still see the oxygen bridge and the top carbon with its hydroxide (HOCH2). Sometimes these chains are cross-linked. This makes a spiraling form of starch called glycogen. Animals use this form to store energy. The little black granules are granules of glycogen, which again is chains of glucose. When energy is needed these chains are broken up into glucose sugar that can be burned for calories. Recall that when glucose bends and connects to make a ring, it can also form the beta-glucose version where the OH is oriented upward. Plants use this form to make celluose (fiber, plant walls, wood). 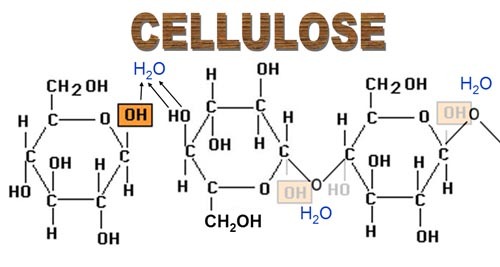 For cellulose the glucose is oriented in alternating up and down positions as they are chained together. Again water is released as they connect. We should pause a moment to marvel at the diversity that plants do with two simple molecules (CO2 and water). With these, plants make sugars, starch, and cellulose. 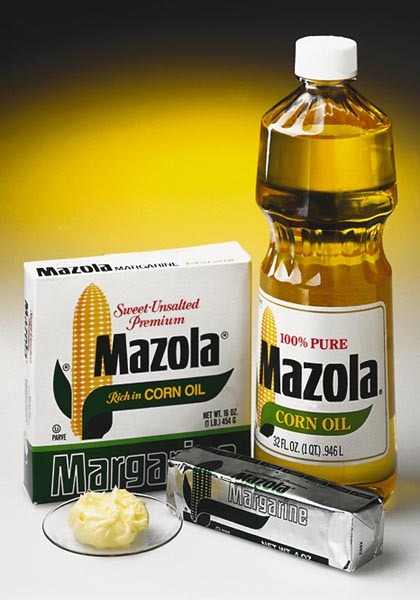 Consequently, sugars are used to make oils and fats. The general name for oils and fats are lipids. Lipids (oils and fats) are another class of organic compounds built from oxygen, hydrogen, and carbon. It's amazing what these three elements can build! Above, you learned a few organic acids. Organic acids with long chains of carbon are called fatty acids. These long "tailed" acids don't dissolve in water and are oily. 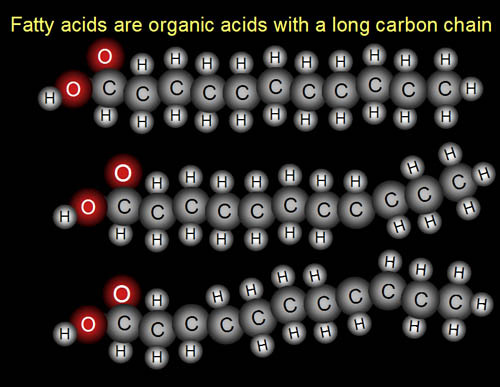 If every carbon in the chain has all the hydrogens it can bond to, then the fatty acid is said to be saturated. The middle fatty acid has two carbons that are one hydrogen short. That's because there's a double bond between those carbons. This fatty acid is said to be monosaturated. The bottom fatty acid have two places where carbons don't have all the hydrogens. This is polyunsaturated. The polyunsaturated fatty acids are said to be healthier. Below you see a glycerin molecule (introduced above). When three fatty acids attach to the glycerin, we get an oil (both vegetable and animal) and fats. 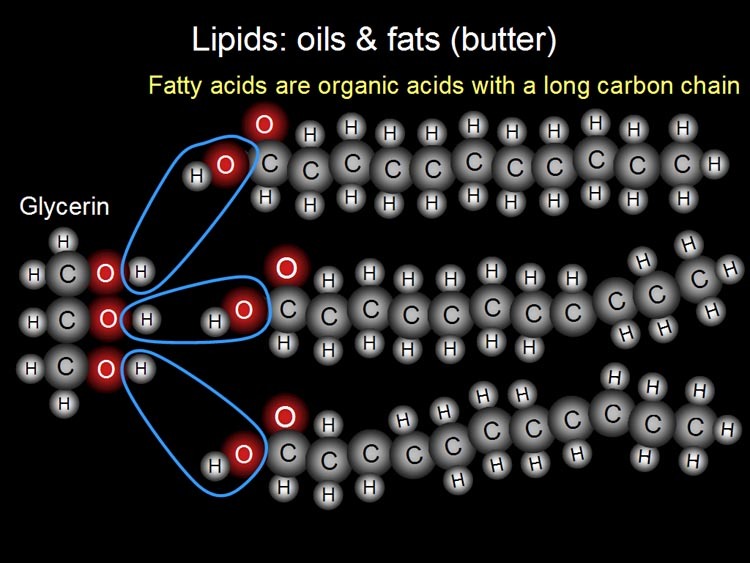 Fatty acids with longer chains create fats. Like many reactions, a water molecule is released. Here is the result of the three fatty acids attached to the glycerin. Yes, it's cramped so the fatty acid chains do spread out. Fat and oils are useful for energy storage and for building cell membranes and fatty tissue. 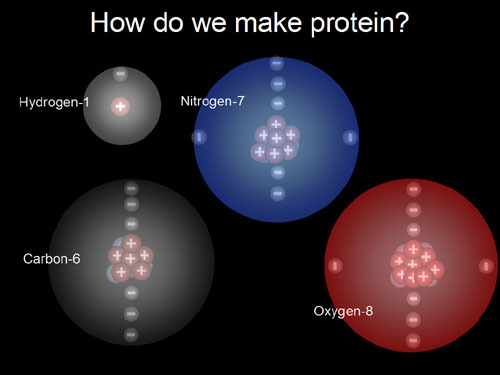 How do we make protein? Hydrogen, carbon, and oxygen are amazing building blocks, but to make something as complicated as protein, we need another element. That would be nitrogen. 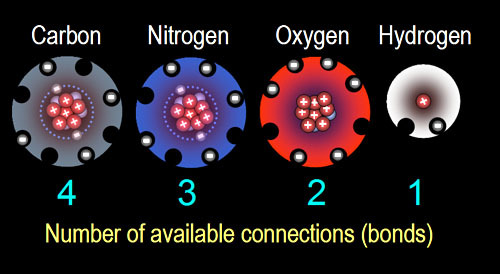 With nitrogen, we have a complete countdown of connections-4, 3, 2, 1. This gives us more diversity with shapes. The shapes of molecules with carbon, oxygen, and hydrogen are primarily chains, hexagons, and small tetrahedrons (3 sided pyramids). They can make a lot of different compounds, but their shapes are somewhat predictable and regular. To make proteins, we need much more variety. Below is a simple protein, but notice where the arrows are. One shows a six-sided ring. That is 6 carbons forming a hexagon. Next to it are two 5 sided rings. Nitrogen is involved in these 5 sided rings. Nitrogen contributes to diversity of protein shapes in two ways. One is that it can make 5-sided rings to add to the diverse shape of the molecule. 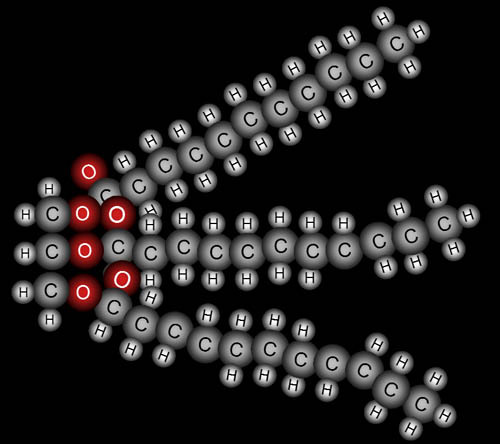 (By the way, the little V-shaped rods represent water molecules. The red portion is oxygen, and the two lavendar ends are hydrogen) They can pass through a hole in this protein. The other way nitrogen helps to add diversity is it's charge. But first we have to talk about amino acids. 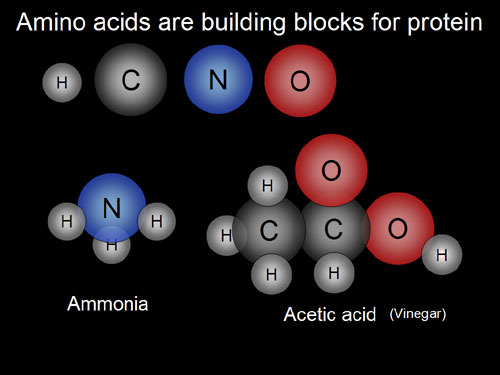 Amino acids are the building block for proteins. The word, amino, is from ammonia. This is where the nitrogen is needed. The acid part of amino acid is from the acetic acid portion of amino acids. This is glycine, the simplest of the amino acids. 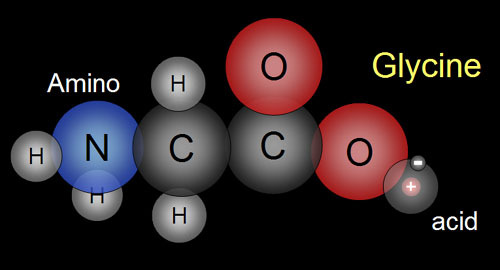 The amino part is the end with the nitrogen attached to a carbon, and the acid part is the other end where the proton from hydrogen can come loose. Mammals only use 20 different amino acids to make the immense variety of proteins it needs. These 20 different amino acids are the same as glycine above, except one of carbon's hydrogens is replaced by some combination of the five elements on the right. Sulfur (S) is needed for two of the 20 amino acids. The proton bound to the acid part of the amino acid will come loose and be attracted to the top end of nitrogen where there's a pair of electrons. 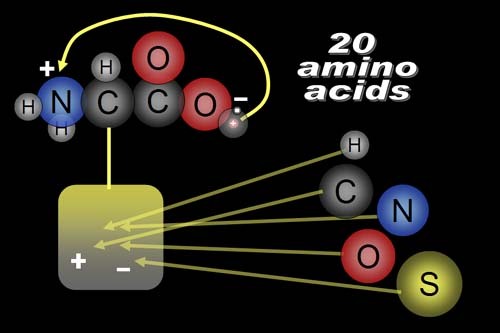 This gives amino acids the ability to push and pull on other amino acids that have two unlike charges. Here's another protein. You may notice the six-sided carbon rings. However, in the middle the protein is quite complex. Again, it's the amino acids ability to have plus and minus charges that push and pull on each other and form a almost infinite number of shapes. Proteins are made by connecting amino acids together. 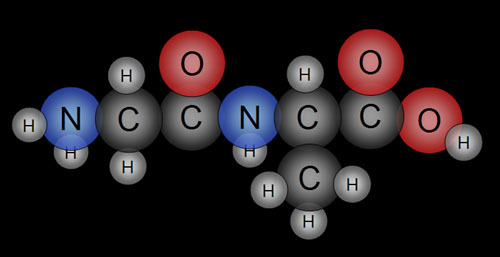 Here the acid end of glycine will connect to the amino part of alanine. A water is released in the process. This is after the two amino acids are connected. Notice the ends still have one amino end (left) and an acid end (right). That means more amino acids can be connected on either end. So the building process continues until a protein is built. It might have hundreds or thousands of amino acids. Chemical: This type gets involved in chemical reactions. Antibodies and enzymes perform chemical chores. 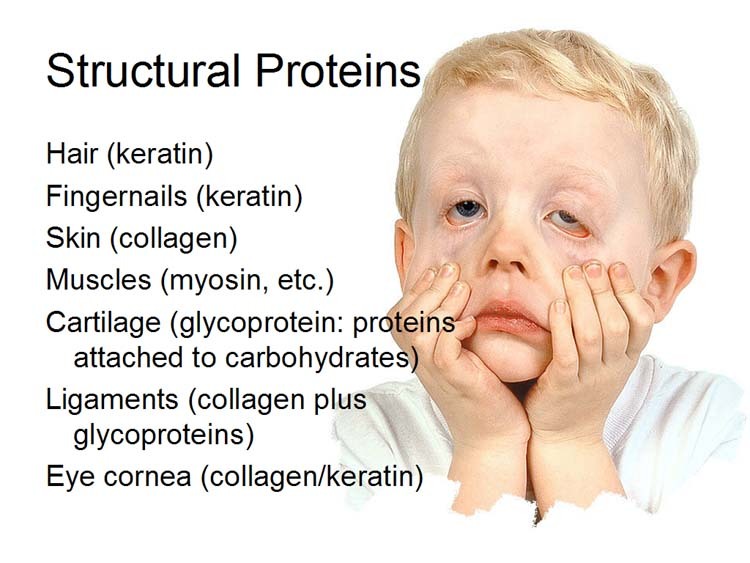 Below are a few examples or chemical proteins. 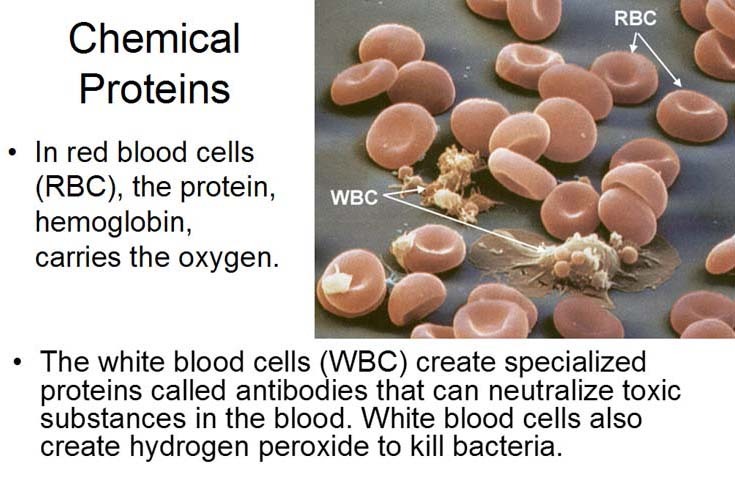 The protein, hemoglobin, is used because of its chemical ability to carry oxygen. Antibodies are specialized proteins. 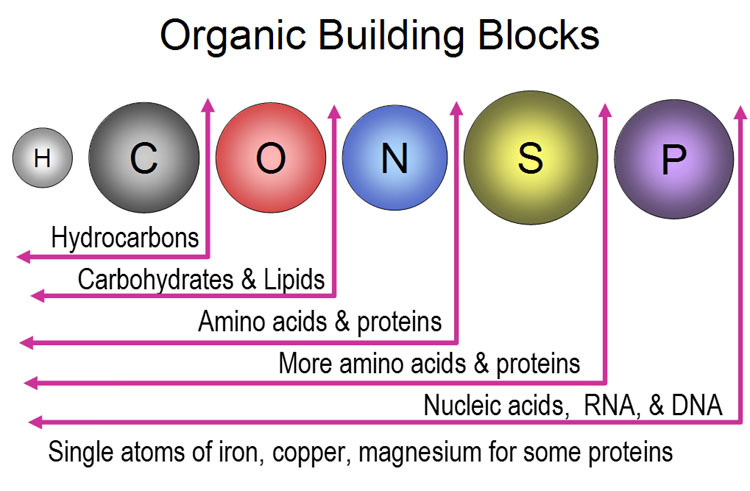 We will end our organic building blocks with the ultimate of building blocks, DNA. Below is one rung in the DNA ladder. We need just one more element to build it. That is phosphorus. Phosphorus is surrounded by four oxygens (phosphate), These form the outer rim of the helix coil. See yellow and blue spheres in picture. The phosphate is connected to a ribose sugar (5 carbon sugar). This is connected to either a single ring or double ring of carbons, nitrogens, and hydrogens. Guanine and cytosine rings are shown, but there are two more types of rings. Below are two rungs of the DNA ladder. It's amazing that only five elements are needed to make DNA. Three rungs of the DNA ladder is needed to code each of the 20 amino acids. 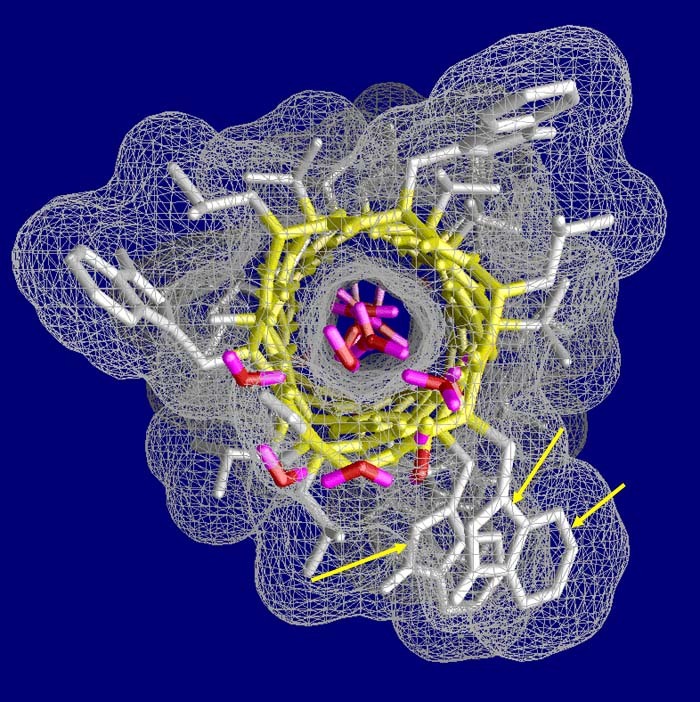 With millions of these rungs, you can code many amino acids that are assembled into all the proteins a body needs for making structures and for directing chemical reactions (enzymes, hormones, chemical proteins). Below is a table that summarizes the elements used to make the various kinds of organic compounds. Trace amounts of iron, copper, and magnesium is used in some organic compounds. For example, hemoglobin needs one atom of iron to help carry oxygen. Chlorophyl needs an atom of magnesium. 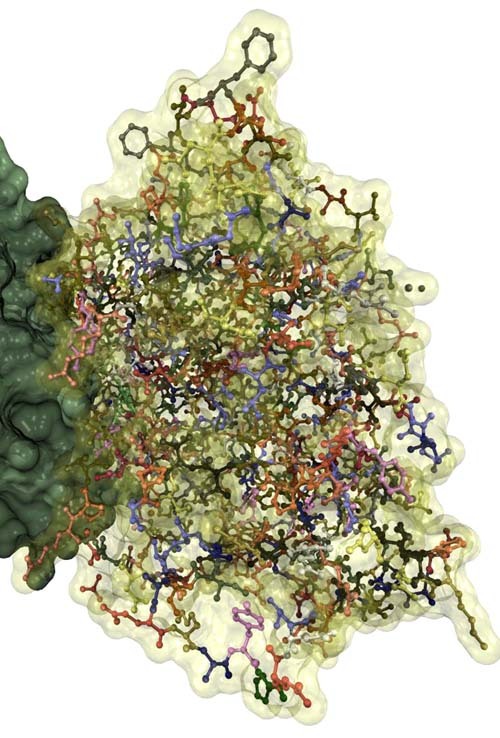 Other proteins need an atom of copper. The amazing thing is the immense diversity of life done with just a few elements acting as building blocks that build large building blocks that building even larger building blocks.